A couple of weeks ago, I decided to perform the Emperor’s Mercy on Rogue Trader. It looked at me with those sweet grim-dark eyes, expecting me to take it on another trip on the Shadow Labyrinth. It reminded me of our adventures fighting orks, chaos, and tyranid monsters. 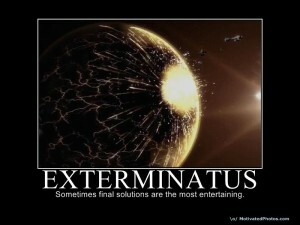 It reminded me of the awesome story conclusion I was planning in a few sessions. It showed me what it could be if I just held on a little longer. And, when it raised its proud space wolf head and howled the call for war, I shot it with a bolt gun. As sad as that was, it was a better death than the slow lingering crawl towards oblivion that would have been its fate. Months before the mercy killing, I had been debating ending Rogue Trader. It was a hard decision not only because Warhammer 40K is a favorite setting of mine, but the 40K games were Fandible’s first dive into roleplaying and podcasting together. To let such a story end without a proper ending seemed heretical. Still, the signs were there. The first bullet was one that existed long before the campaign even started. The world we created for our Rogue Trader game was fun and laughably grim, but it was not really Warhammer 40K. As I previously said in my Death Watch article, I had skewed the rules and setting so much, it might as well be Star Wars. Why? Because the excessive grim-dark didn’t work for the Fandible crew in a space opera. It worked fine when we played Dark Heresy, but I wanted a story where the crew could affect change and, despite the lore adjustments I was forced to make, there were still setting constraints that seemed to hinder that. The second bullet was the numerous games we’ve begun to play over the years. With all the systems and genres we gamed in, the time between Rogue Trader sessions seemed longer and longer. It reached a point that Rogue Trader became less a fun pastime and more an obligation. When you have to work on a game because you feel like you have to, that isn’t fun, no matter how many people you get to slaughter. Plus, new games like Bulldogs and Planet Mercenary had started scratching my space opera itch. The final bullet came in the form of a giant blue monster. Billy was no longer feeling the excitement he initially felt while playing Barsher D. Barsher. Which was understandable. Great roleplayers like their characters to grow and change over time, but an ork like Barsher tended to be fairly consistent – when your only tool is barshing, everything looks like it needs to be barshed. So, Barsher left the 40K world and we tried to continue on, but it just didn’t work. It’s only recently that I realized why. Barsher was the only thing keeping Warhammer 40K interesting for everyone. The setting and the system didn’t work for Fandible, but we continued on because the relationship Barsher had with the other characters seemed to add extra energy to our games. With him gone, the bullet shaped flaws started to show. It was a testament to Billy’s great character, but it showed a fundamental flaw in the game. All the players should interact equally to bring about a fun and interesting story. So here I type, telling the Fandible listeners that sadly Rogue Trader must be ended. I hope you can forgive my heresy and don’t send the Inquisition my way to convince me otherwise. Its not the end of 40K games as a whole though. At some point, I plan to run a Dark Heresy game just to try out the 2nd edition. Who knows, we might find the spark we lost. I hope so. 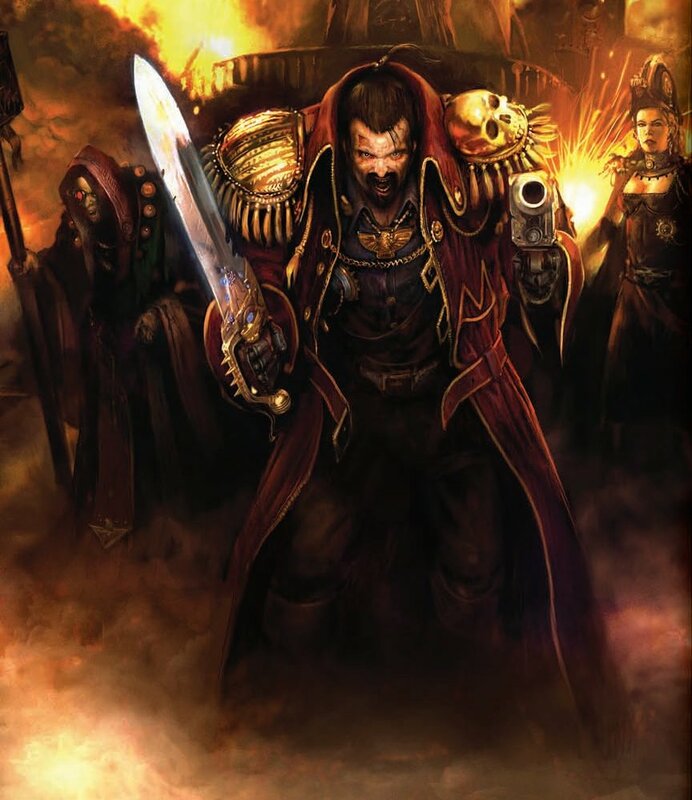 In the near future, we will have a Rogue Trader GTRT where we will discuss where the story was headed, our favorite moments, our greatest frustrations, and fan questions. If you have any questions or awesome moments you want us to discuss, please leave it in the comments. Sorry to hear it, its never easy when have to kill a game you really like. But if the crews heart is not in it, then the stories already dead, regardless if words continue to march across the page. Sad to hear the end of the Shadow Labyrinth’s adventures. But looking forward to hearing about plotlines that needed to be finished and the rest of the stuff in the GLRT. I loved the fact that you guys didn’t go that much for the GRIMDARK that seems to permeate the setting. You and DiesIrae on RPG.Net convinced me that the satrical and swashbucklering elements of the setting should not be forgotten. But yeah, there was a distinct lack of exploitation and imperialism in a game that is pretty much a commentary on the British Empire/East India Trading Company. Looking forward to seeing you tackle more games, hopefully more space opera in some sense. Even if the game ends, know that in my heart of hearts, leaping from cockle to cockle, Captain Awesomepants will forever leave no buckle un-swashed. I think we all know that Barsha would destroy the game. Barsha barsh’d da game realz gud. Understandable. I hope someday you all return to HEX and Atomic Robo though. FOR SCIENCE! Definetly looking forward to hearing about the planned conclsion. The Cpt. Awesomepants/Barsha relationship was one of my favourite. The Fandible take on Rogue Trader was really enjoyable to listen to. However, when it’s not fun anymore, change it. Or, as in this case, nuke it from orbit. Sorry to hear it’s gone. I actually found this podcast when I was looking to run Only War (as a fairly new GM, I like to see how other groups play/games are meant to be played). Yours is one of the few podcasts that have actually ran it. And from there, I listened to Dark Heresy, Death Watch, and of course Rogue Trader. Which led to the rest of the site. Sad to hear the end of the adventures of the Shadow Labyrinth and crew. Your Rogue Trader series has been a great inspiration to me and my games, and I’ve not found a better 40k play podcast out there (Believe me — I’ve tried!). I’ve always felt you guys do 40k the way it’s meant to be run, grimdark be damned! I’ll be thrilled if you do something with DH2, but until then, I’ll be tuning in to your other shows! I will miss Rogue Trader, but it could always come back. And even if it doesn’t, I can always just listen to the podcasts again. I look forward to seeing what you release to us in the future. Shame it’s ending, but the reasons do make sense. I know I was personally starting to lose some interest after Barsha ‘ascended’, but I’ll be curious to hear what the planned conclusion was for the campaign. And good luck with Dark Heresy 2.0! Enjoyed the beta test, though I’m not sure what all they changed with the official release. Ah, it happens to all campaigns, for better or worse I guess… be interested to hear the wrap up. At least Barsha got his big finale. But a huge, genuine thank you to you guys. Xenos Night Out was my first exposure to rpg podcasting, and you’ve been a huge influence at my tables. End of an era, maybe. But keep on rocking into the new one. I echo Andante where tone of Rogue Trader is concerned. Gonna echo pretty much everyone else, gonna miss it, sad to see it go. Would suggest you guys check out DH 2.0 because it is a big fat step up mechanically. And that we never had a single problem with the tone you guys set here, 40k was not always as serious as it is now, and by doing it Fandible style you took it back to a all around better time. To the edges of the stars and the clash of a warp addled child with unreasonable power, and a prideful man of great charisma and true grit. Though we see not the final confrontation, I hope it ended with everything going down in purifying fire. Yeah, you could feel the player’s tolerance for the system waning in the game’s latter days. Maybe it’s best the finale remains left to the listener’s imagination. That said, this game was an inspiration. Every RPG podcast talks about what makes a “good” character. This series was a live demonstration on how characters who foster strong party dynamics and push the narrative in interesting ways will trump a hundred page backstory and badass stats every time. Heck, even the group’s admonishments of the setting motivated me to sell the hell out of the 40k universe when I sat down to run my own Rogue Trader game. All I can say is, well played Fandible. Well played. Ah, the end of era. Perhaps. I feel a redux may be order. Or perhapsthe llittlest traders could return. I think there was plenty of swash in the game and that’s the way rogue trader should go. Blow Old Ironsides and Damn the Torpedoes! It’s more than a little sad that we won’t get to hear the conclusion to this adventure. I found Fandible through Rogue Trader, and even though Barsha was the heart of the group it (and your 40K games in general) have given so many running jokes that can still be felt again. Even though the ship may never emerge screaming from the Warp, its emotional echoes carry through. All the old adventures are still there for us, and you have generated so many new and compelling narratives for us to enjoy. Rest in Peace, Shadow Labyrinth.